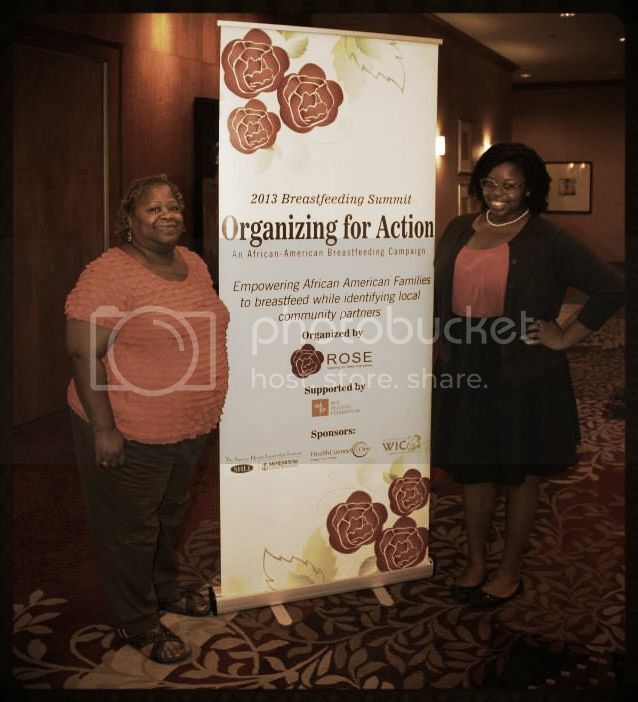 In 2012, Reaching Our Sisters Everywhere Inc. (ROSE) held its first of three annual Breastfeeding Summits titled, 2012 Breastfeeding Summit: Reclaiming An African American Tradition at Morehouse School of Medicine, funded by the Office on Women’s Health and strongly sup ported by the W.K. Kellogg Foundation, American Academy of Pediatrics, and the Georgia Breastfeeding Coalition. The 2012 Breastfeeding Summit set the stage for exploring the evolution of breastfeeding disparities for African American families and identifying the pathway for reforming healthcare through breastfeeding. It was at this Breastfeeding Summit, that the Its Only Natural Campaign was first introduced to the 200 Physicians, nurses, dietitians, allied health professionals, government employees, and community health workers that attended the two-day event. Since 2012, ROSE has held the 2013 Breastfeeding Summit titled, Organizing for Action: A Breastfeeding Campaign, and the 2014 Breastfeeding Summit, Black Health Matters: A Breastfeeding Movement. The 2013 Summit, explored the necessary action steps that needed to take place to further the impact of all concerted efforts. While the 2014 Summit, Identified the methods for cultivating a transformative movement. ROSE led development of breastfeeding action plans and participants’ commitment to assisting each other with long-term goals and objectives to increase breastfeeding in the African American community. Each Summit awarded continuing education credits and garnered a turnout of more than 200 attendees from across the nation. In addition to ROSE own breastfeeding summits, this organization has collaborated with other organizations and educational institutions to put forth several breastfeeding conferences across several states. ROSE seeks to collaborate with healthcare providers to review interventions and identify methods that provide the best possible health outcomes and breastfeeding support for African American Communities. ROSE has titled this collaborative the Black Breastfeeding Circle (BBC), a national initiative to unite healthcare providers ranging from Physicians to community health workers with a vested interest in black infant and maternal health through addressing breastfeeding disparities. This will provide a forum for these individuals to come together to discuss, disseminate, and implement best practices for engaging families within the African American community on breastfeeding and lactation management. ROSE seeks to have regionally designated BBC’s across the nation, to allow for regions specific health initiatives while still providing an environment for all individuals involved to remain connected to further a collective impact. ROSE Community Transformer Training was initially funded by a grant from Amerigroup. This two-day training consist of the us of a evidence based curriculum on providing peer professional breastfeeding support. During the training, individuals learn the essential skills for providing peer counseling in the area of lactation management and the methods for making referrals to resources for interventions outside of their scope of practice. They are also taught how to lead ROSE Breastfeeding Clubs called, Breastfeeding League IN a Kindred Settings. Individuals must apply to become a Community Transformer, with the pre-requisite of being a parent to infants that have been breastfed for at least 6 months and had a positive experience. Those that apply are then interviewed and invited to attend the training, and are then compensated for their participation. To date, there are 15 Community Transformers in the state of Georgia. Through a partnership with the Breastfeeding Center at Boston Medical Center and funding from the W. K. Kellogg Foundation, ROSE intends to expand Community Transformers trainings to MS, LA, and AL in the next year. The W.K. Kellogg Foundation funded the development of the curriculum for ROSE’s Breastfeeding Club. Breastfeeding clubs are open-forum discussions conducted by trained Community Transformers in an informal setting. In these environments families can learn more than basic breastfeeding, but the mechanics of breastfeeding, which helps to increase the duration and multiply the benefits. Each breastfeeding clubs are set to cover one of the following topics: Advantages of Breastfeeding, Establishing a good milk supply, Techniques and overcoming challenges, and Introducing solids and weaning. The curriculum created is thoroughly developed through evidence-based practices, and has been packaged into a Breastfeeding Club Companion Manual for Community Transformers. ROSE conducts trainings on breastfeeding support for health care providers, peer counselors, and community health workers who work with underserved communities and families of color. In 2013, ROSE provided training in New Orleans, LA for 300 public health employees; in Anniston, AL for 100 healthcare providers which included physicians, nurse midwives, nurses, nutritionists, nursing students, and lactation consultants; and Jackson, Tupelo, and Columbus, MS where 286 WIC and public health staff were trained. ROSE provided 10 trainings throughout Mississippi, the state with the lowest breastfeeding rates among African Americans, in 2014. During trainings, ROSE engages participants to think big and imagine being the change agent for breastfeeding in their state. ROSE empowers participants to share the message of supporting breastfeeding in African American communities to all the staff and the customers. ROSE encourages trainees to consider the families they serve as partners, not recipients.